An IT industry analyst article published by SearchDataCenter. Some resistance to converge does happen within some IT organizations. Siloed staff might suffer — convergence threatens domain subject matter experts by embedding their fiefdoms inside larger realms. That’s not the first time that has happened, and there is always room for experts to dive deep under the covers to work through levels of complexity when things inevitably go wrong. That makes for more impactful and satisfying jobs. And let’s be honest — converged IT is far less threatening than the public cloud. 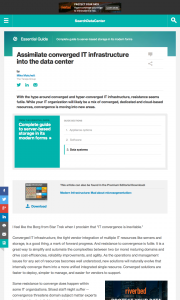 This entry was posted in Published Articles and tagged Converged Infrastructure, hyperconvergence, Modern Infrastructure magazine, SearchDataCenter, Taneja Group by Mike. Bookmark the permalink.